I mentioned the other day how I use Book: My Autobiography as a read-aloud with my sixth graders at the start of the year as a way to introduce creative non-fiction and a history lesson around the evolution of stories and books over time. 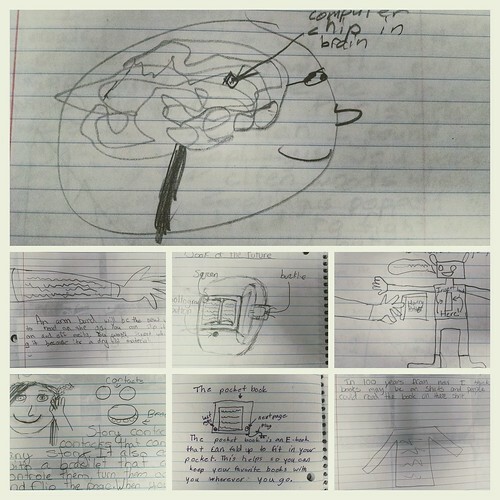 A writing prompt in their writing notebook afterwards asks them to consider the world 100 years into the future — 2117 — and sketch out and explain some ideas about what stories will look like and/or how stories will get delivered to readers. In other words, what will books be like in 100 years? 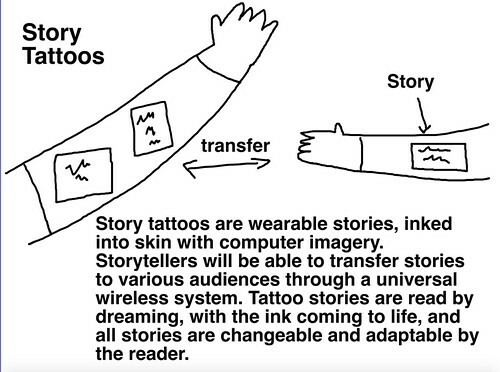 The picture above is my example — I envision Tattoo Stories which can be shared and remixed with others. Who knows. I suspect we will still have good ol’ book with us, too. I hope so.